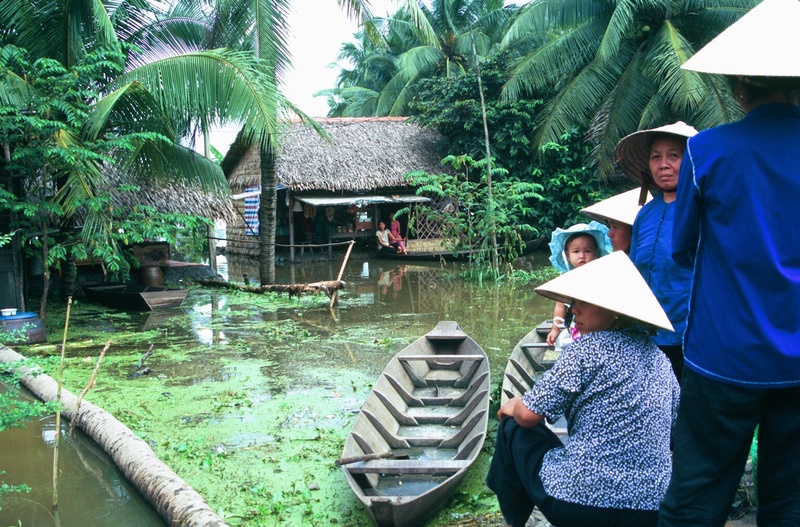 Mother and daughter, we embarked on a three-week tour of Vietnam with Intrepid Travel, expecting a tropical paradise, some good Pan-Asian food, and remnants and reminders of ancient civilizations and of the American war debacle. From the beaches of the South China Sea to the river towns of the Mekong Delta, from ancient Chinese traders’ villages to Ho Chi Minh’s hometown, we found all of that in a fragile, leafy, lovely kingdom, and a surprise––a veritable tidal wave of affection and hospitality from the Vietnamese. 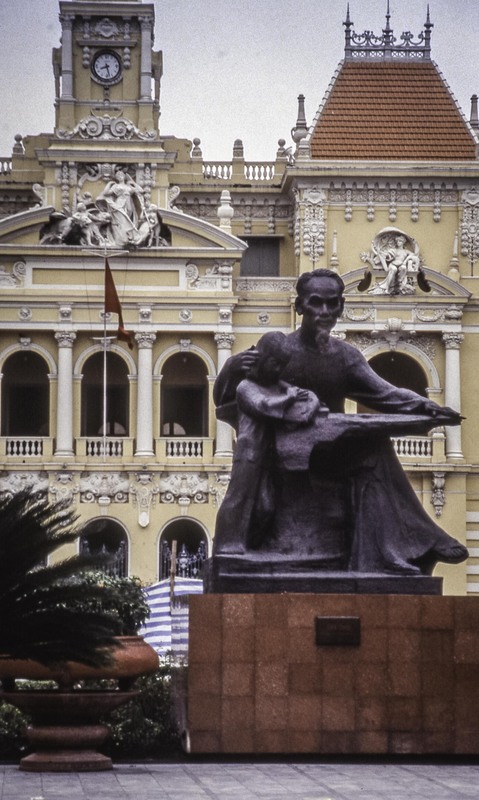 Before we met up with our tour group, we spent 24 hours in Ho Chi Minh City (formerly Saigon). We awoke at daybreak in a shuttered room at the Majestic Hotel, opened in 1925, a white wedding cake of a place restored to its former French colonial glory overlooking the Saigon River. Standing on our balcony, while motorbikes buzzed like bees below our feet, we watched mothers soaping up their babies in the muddy river, and lines of people practicing tai chi beneath purple-blooming jacaranda trees. Fluttering down the boulevard on bicycles like flocks of colorful birds peddled young women in ao dais–semi-see-through, high-necked dresses slit to the waist, with matching long slacks beneath. 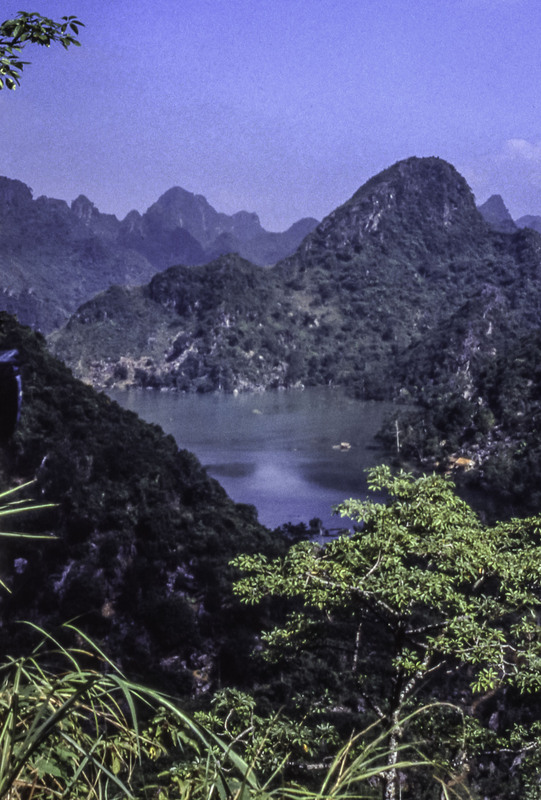 We closed the shutters as the sun rose to a white-hot glare on the neon signs on the far shore, and the air turned thick, hot and wet––which describes the weather on most days in Vietnam. We went sightseeing around the city, stopping at the Reunification Palace, a Communist government showplace; on the roof sits a Huey helicopter, an artifact of the infamous American evacuation of Saigon in 1975, which took place from the roof of the U.S. Embassy. In Cholon, the Chinese district, we browsed in the Binh Tay Market, where you can buy everything from a live duck, slaughtered on the sidewalk while you wait, to DVD knock-offs and (fake) tiger claw powder. On the way back to the hotel, we ended up in a magnificent, century-old botanical garden and a heartbreakingly run-down zoo where, under a canopy of 200-foot-tall breadfruit trees, sad elephants and tigers with dull, sagging coats paced madly in French-built iron cages. Within the gardens, the Museum of Vietnamese History is an elaborate, circa-1929 building filled with relics from the Cham and Khmer civilizations, and from Angkor Wat. In a wall-sized poster and a bronze sculpture, Uncle Ho is conspicuous in the museum, as he is throughout the country. Our hotel, the Majestic, is on Dong Khoi street (formerly Rue Catinat), along with the Hotel Continental, said to be the first hotel in Saigon (1880) and famous as the notorious hang-out of Vietnam War-era journalists. Nearby, an expats’ gathering place since the 1930s, the Grand Hotel has been restored to its former French colonial grandeur. At the end of our day in Ho Chi Minh City, we headed to happy hour at Eon Heli Bar, on top of the tallest building in town, along with lots of millennial locals, grizzled expats, and tourists waiting for sunset over the city. If you’re a Graham Greene fan, you’ll enjoy this essay about the various sites around the city where Greene and the characters in his novel, The Quiet American, hung out. 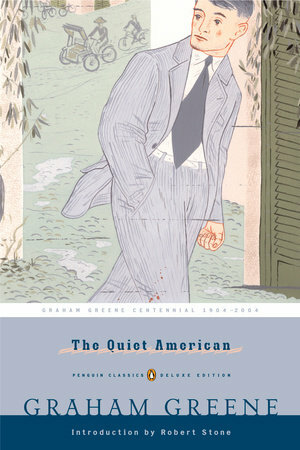 For sale all over the city, the iconic novel, set in the 1950s, swirls through French and British colonialism and the arrival of the CIA, in a dark, rich tale of a jaded British journalist and his young Vietnamese lover; a CIA agent, and a French inspector. Michael Caine also starred in the 2002 movie version of the book. 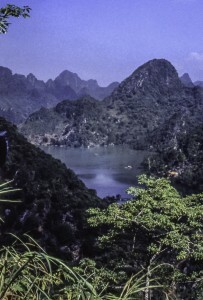 After connecting with our guide and our traveling companions on the Intrepid Travel tour––four Aussies, two Germans, an American couple and the Norwegian guide—we drove south, in a van, along the Mekong River, past rice paddies and coconut palms bent low over waves of lavender-hued morning glories. As in our dreams of Vietnam, men in conical hats and black pajamas drove water buffalos behind plows. We saw evidence of a typhoon that had swept through earlier that week, flooding the roadsides, the vegetable gardens, and the thatched-roof huts. The farther south we drove, the higher the water rose around us until the road seemed to float above a vast lake. Unconcerned, the locals paddled in little boats right into outdoor cafes and up to food vendors, and perched above the knee-deep water on high counter stools to dig into bowls of pho—a brothy noodle soup piled with vegetables and slices of meat. In Mr. Day’s house, as in most Vietnamese homes, Buddha has his own fruit- and flower-bedecked shrine where incense burns eternal. Another household god, the TV, also burns eternal; bluish lights flickering like fireflies along the far shore turned out to be reruns of “Baywatch” and “I Love Lucy.” After a dinner of pork stew, spicy grilled prawns, and long bean, we slept under mosquito nets on cots in a common room, open to a warm, rainy night blinking with lightning. A basket of fresh, French-style baguettes–a ubiquitous staple in Vietnam–arrived by skiff early the next morning, to go with our breakfast of bananas and thick, filtered coffee. Exploring the island, we encountered green snakes in the lotus pond, and dragonfruit, rambutan and paw paw orchards. Mr. Muoi showed us a type of hibiscus that blooms white in the morning, turns pale pink by noon and vivid magenta at night, living only a single day. Back aboard the longboat, we motored down the river through a web of canals bordered thickly by mangroves, palms and tall grasses. Among the weeds on the riverbanks–and throughout Vietnam–are crumbling French colonial mansions in overgrown gardens. Like a ghostly apparition, the grey stone spire of a Gothic cathedral reached into the humid yellow sky. School children in navy blue and white uniforms raced down the paths on either side of the river, waving at us and screaming with delight. Back on the river, we reached the Cai Be floating market, where dozens of beamy, 30-foot-long wooden boats groaned under the weight of the local harvest. 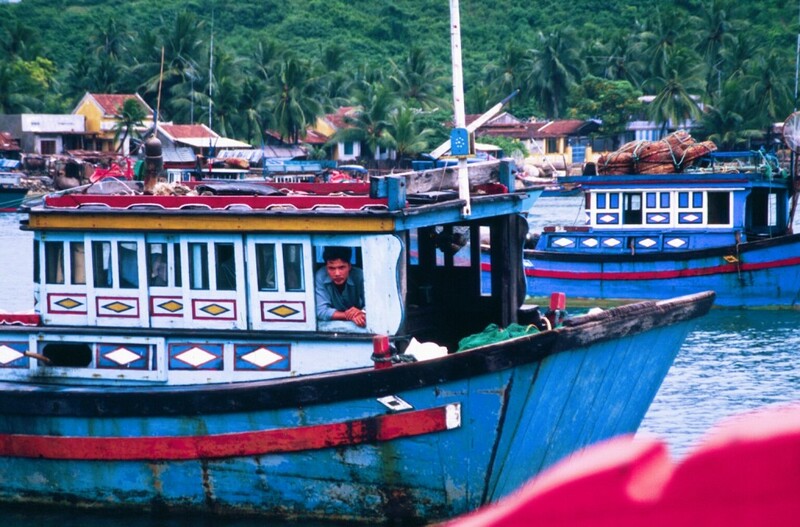 Families live on the boats, selling produce and fish. Children are the vendors, hawking prawns and crabs, pineapple, coconuts, jackfruit and stalks of bananas, “water spinach,” huge orange squashes, and armfuls of long bean. 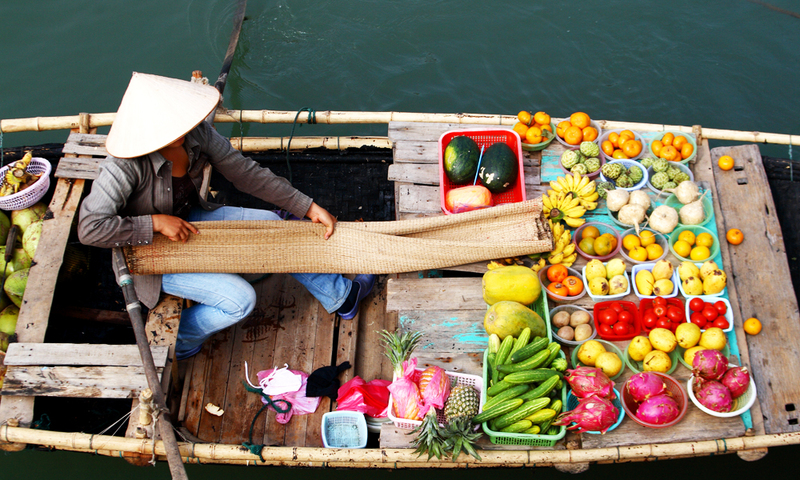 Fresh fruit, vegetables and fish are abundant in outdoor markets and in eateries throughout Vietnam. We found the most beautiful market in Dalat, a European-style mountain resort town, complete with a half-sized Eiffel Tower and elegant, still-French-owned hotels. One of the few towns to escape war damage, Dalat is a cool, misty mirage in a pine forest at 4,800 feet, surrounded by coffee plantations. Deserted villas of long-gone, French rubber-plantation owners are sprinkled across the high ridges around the town, which has a uniquely sophisticated ambiance, due to a waxing and waning population of several hundred university students, French tourists, and Vietnamese honeymooners. Half asleep on the sand at the end of the afternoon, we heard screaming––Thuy had spied a palm snake in the tree overhanging our beach towels. The snake is the same shade of green as the palm fronds, and highly poisonous. Chau ushered us back up the gangplank of the boat and we motored off to an island fishing village, where young girls paddling six-feet-across round baskets transported us, one at a time, from the dragon boat to a rickety dock on the small, rocky island. On a path recently drenched by a thunderstorm, we waded in the mud as quietly as we could through a village. The fishermen were asleep, as at night, they sail great distances to fish in their bright blue and red boats. The village kids trailed us, asking, “Where you from?” and “How many children?” and “Where is your husband?” The littlest ones held up their hands to us and swirled their tiny forefingers around in their palms, a traditional greeting. We traveled with Intrepid Travel, an Australia-based company that has been in business for about thirty years. They feature three types of affordable tour styles for small groups, and they also offer private, tailor-made itineraries. We liked having accommodations and transport handled, and an on-board guide who traveled with us but did not “guide” us at the destinations; rather, he gave us advice on what to see, where to eat, etc. We had almost completely free time every day to explore on our own. especially if you were on a tour or a cruise! Loved Vietnam! So unusual; one of the few places that truly feels “foreign” anymore.